Jewish Home activists gather in Lod, decide to convene Central Committee to approve an outline for choosing the party's Knesset list. 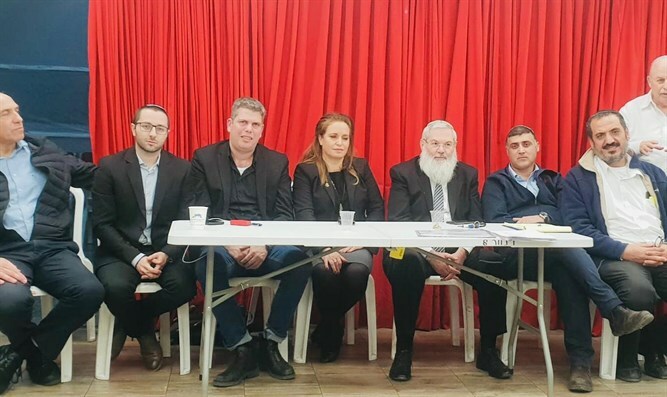 Dozens of key Jewish Home activists gathered in Lod on Sunday evening at the initiative of the Deputy Mayor of Modi'in, Amiad Taub, and the Deputy Mayor of Lod, Yosef Harush. The participants - including deputy heads of municipalities and council members - formulated an agreed outline for the composition of the Jewish Home’s list for the elections for the 21st Knesset. According to the plan, the party’s Central Committee will convene on Thursday by a temporary order according to a summons signed by more than 370 members of the party's Central Committee. At Thursday’s gathering, a vote will be held to determine that a regular majority of the present members of the Central Committee will be sufficient to change the constitution. In addition, the proposal will be submitted to a second, secret ballot between two alternatives and without the possibility of members of the Central Committee to abstain. According to the first proposal, the chairperson of the party will be chosen by an advisory committee, that will submit the name of an appropriate candidate to be approved by the Central Committee, as well as the name of a woman for the third spot on the list should one not be chosen naturally. All other members of the list will be selected by the Central Committee. According to the second proposal, the entire list will be chosen by the Central Committee. Amiad Taub and Yosef Harush, the initiators of the outline and the conference held on Sunday evening, said that "a new spirit is being felt in the party. A spirit of unity, the pride of a unit and an effort to save political religious Zionism from an understanding of the magnitude of the hour. This is just the beginning - the list that will be chosen will add more forces on the way to great success in the coming elections." Last week, the Jewish Home Central Committee did not approve the proposal to elect the party’s list for the next Knesset by members of the Central Committee, meaning that, according to the party constitution, primaries must be held in which the Jewish Home list will be chosen. However, Jewish Home Director General Nir Orbach said following the results of the vote that holding primaries was not feasible and that consultations would be held regarding the next steps.